Girls' gym shorts are an excellent selection when you need to outfit an active girl, even when she's not taking gym. While gym shorts don't exactly make us think of sophisticated childhood clothing selections, they can be comfortable, versatile solutions for every girl -- both on and off the courts. Looking for styling suggestions for gym shorts? Take a look at these for active gym shorts outfits and casual weekend ensembles. To Dance Class: Do you have a daughter who is taking modern dance classes? Consider packing a pair of comfortable gym shorts for her to wear over sweats or leggings for warm-up activities and practice. Gym shorts can easily be layered over a leotard or another body-conscious dance top. To the Courts: Pair shorts with a tank top with lace edging, or a mesh tank top that has a small emblem on the chest that's whimsical or delicate. If you are dressing a tomboy, consider a mesh jersey in a plain color and coordinating shorts, plus sneakers. To the Park: For warmer weather, look for sporty tops and shoes that make gym shorts look cute. Toss on a girl's polo shirt for a preppy look, or a swingy top that leaves the shoulders bare for ease of movement. You can also toss a pair of gym shorts underneath a frilly, long dress, if your child is still in diapers or likes to twirl a little too much. To the Indoor Gym: If your child is prone to bumps and bruises, suggest that she wear a pair of leggings underneath her shorts. She will avoid any cuts and scrapes from sliding on hardwood floor or practicing on gym equipment, and the style is incredibly comfortable. To School: Think that gym shorts are too casual for school? Don't forget about field trips and other activity days. Gym shorts are great for school Field Days and exploration activities, and they are easy to slip into a small child's school bag. For an all-day look, try pairing gym shorts with a hoodie, a polo, and sneakers with fold-down sports socks. If you are helping your child pack for a special sports event or activity, and she'll be changing into the outfit once she's there, look for an all-weather outfit like a lightweight jersey tee, a pair of gym shorts, and a sheer long-sleeve shirt. Gym shorts aren't just made out of that slippery nylon. Here are a few options you might want to explore when shopping for girls shorts. Jersey: This soft fabric can be found in both thin and thick versions, so you can find the right one for the climate and activity. This fabric is a wash and wear selection that's a breeze to find. Nylon: If your child will be layering quite a bit during the season, or is likely to get wet, nylon shorts are a quick-dry solution that leave your child comfortable in changing conditions. These are also great if you don't have much time to dry laundry before the next wear. Mesh: Lightweight, breathable, and versatile, this fabric is great for athletes. With its casual appearance, this fabric is best suited for gym and practice wear for girls. Mesh, an athletic go-to fabric, also lasts a long time and withstands serious wear. You won't have a problem with fabric fading, and shorts made out of this are very durable. Check out these locations online for girls' gym shorts. Amazon.com: Go to Amazon.com to pick up shorts just for girls, and do plenty of price comparison while you are there. Check out the reviews to make sure you're getting a good deal. GapKids: Stop by GapKids for trendy selections with a smart price point. Old Navy: Have a tight budget? Old Navy offers basic selections that often go on sale, and girls love their simple, clean lines. Gym shorts are not just for sports, but for casual, everyday activities. 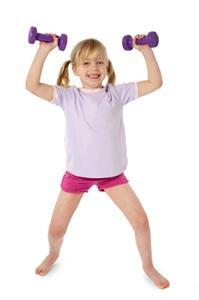 If you have an active child or you know one, pick up gym shorts to round out a wardrobe and keep her comfortable. From dance classes to park romping, gym shorts can fit into any child's wardrobe with ease.